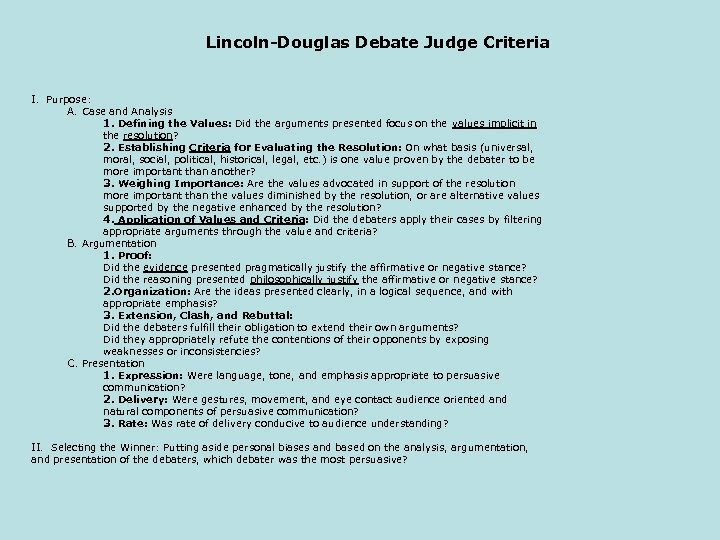 Lincoln-Douglas Debate Judge Criteria I. Purpose: A. 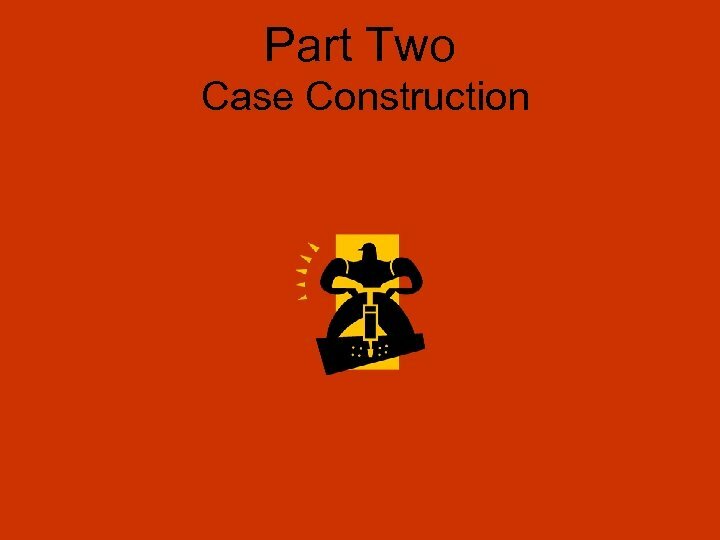 Case and Analysis 1. 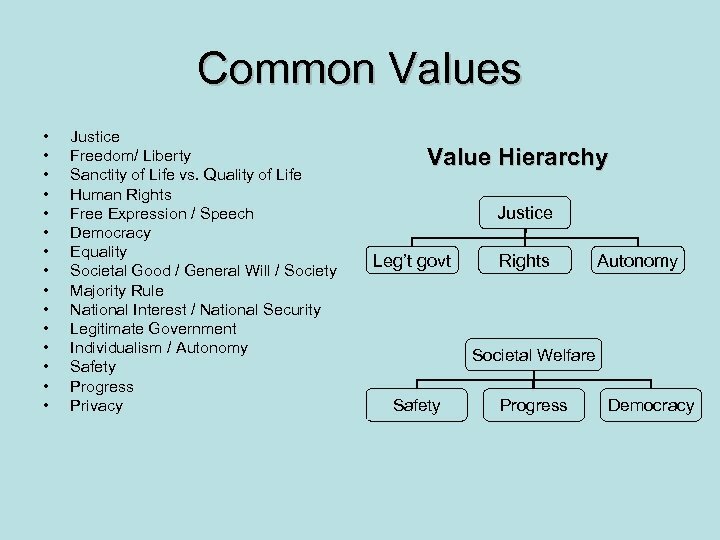 Defining the Values: Did the arguments presented focus on the values implicit in the resolution? 2. 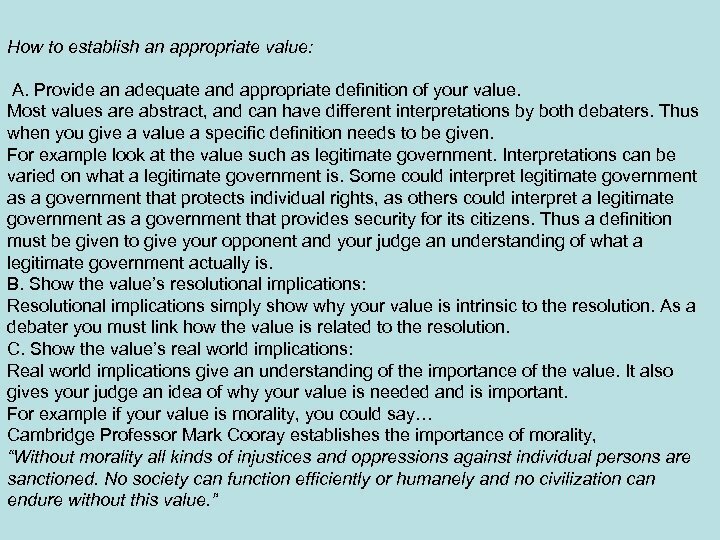 Establishing Criteria for Evaluating the Resolution: On what basis (universal, moral, social, political, historical, legal, etc. ) 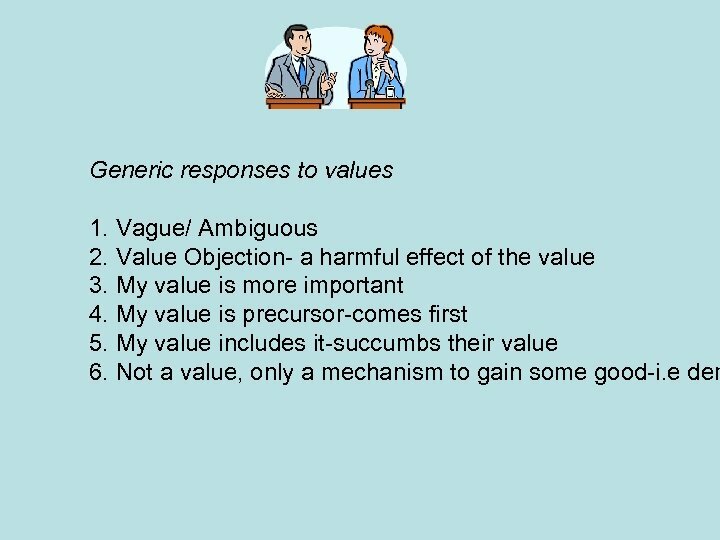 is one value proven by the debater to be more important than another? 3. 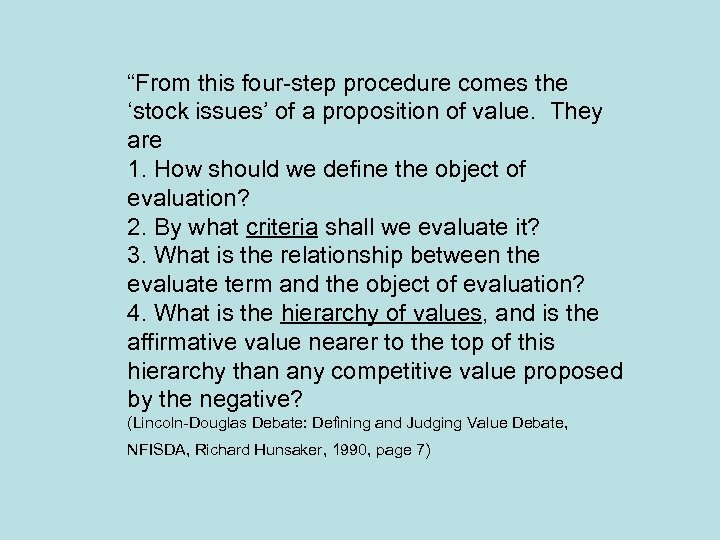 Weighing Importance: Are the values advocated in support of the resolution more important than the values diminished by the resolution, or are alternative values supported by the negative enhanced by the resolution? 4. 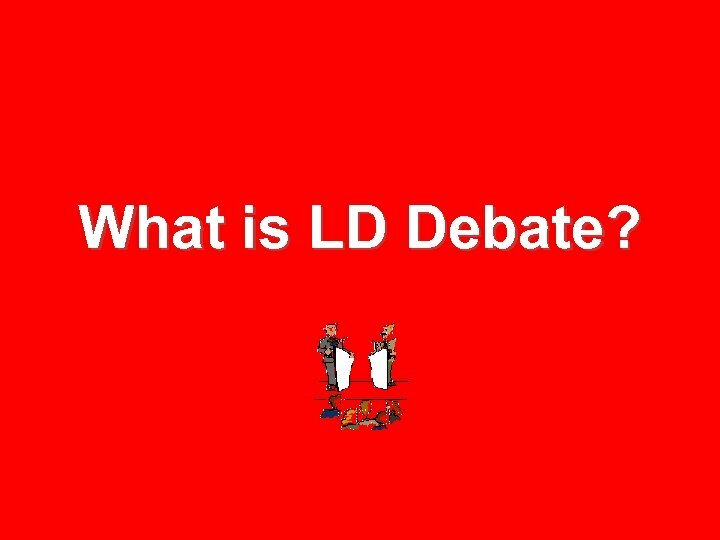 Application of Values and Criteria: Did the debaters apply their cases by filtering appropriate arguments through the value and criteria? B. Argumentation 1. Proof: Did the evidence presented pragmatically justify the affirmative or negative stance? Did the reasoning presented philosophically justify the affirmative or negative stance? 2. Organization: Are the ideas presented clearly, in a logical sequence, and with appropriate emphasis? 3. 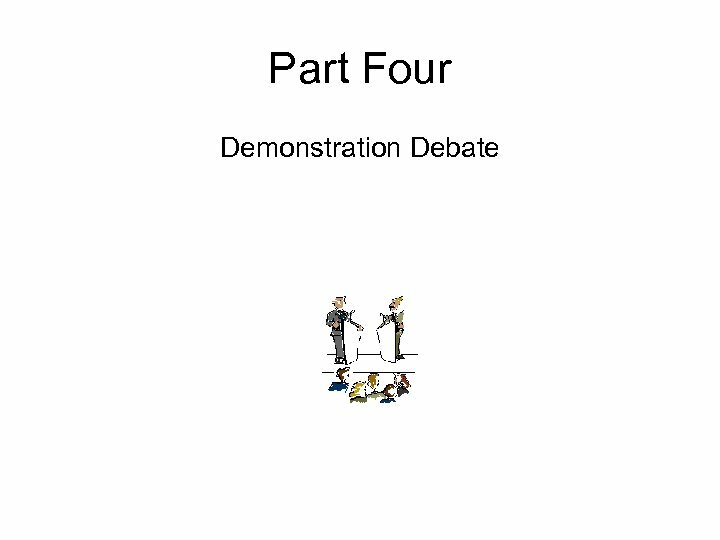 Extension, Clash, and Rebuttal: Did the debaters fulfill their obligation to extend their own arguments? Did they appropriately refute the contentions of their opponents by exposing weaknesses or inconsistencies? C. Presentation 1. Expression: Were language, tone, and emphasis appropriate to persuasive communication? 2. Delivery: Were gestures, movement, and eye contact audience oriented and natural components of persuasive communication? 3. Rate: Was rate of delivery conducive to audience understanding? II. 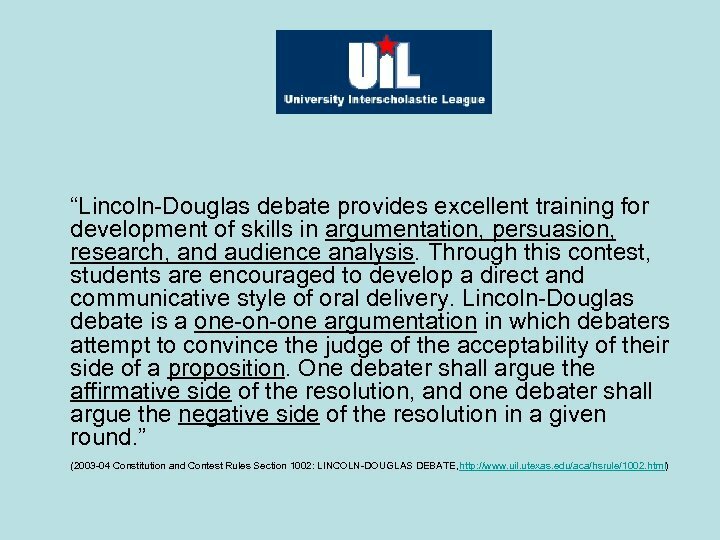 Selecting the Winner: Putting aside personal biases and based on the analysis, argumentation, and presentation of the debaters, which debater was the most persuasive? Time Limits 1. Affirmative Constructive (AC) 6 min. 2. 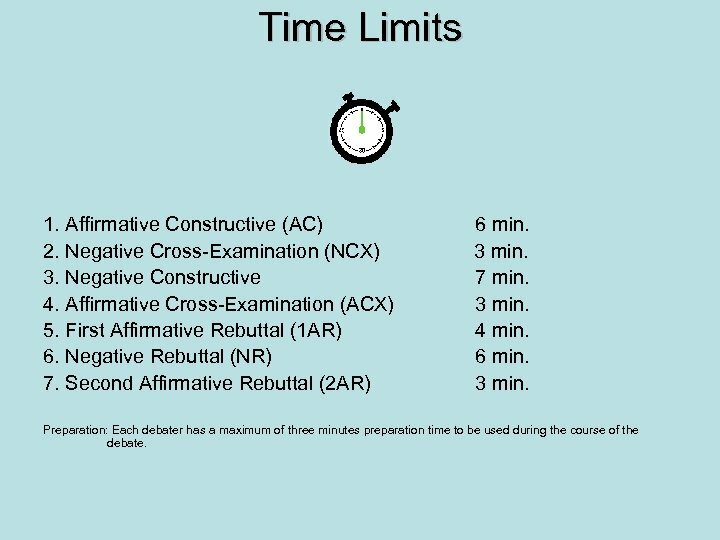 Negative Cross-Examination (NCX) 3 min. 3. Negative Constructive 7 min. 4. Affirmative Cross-Examination (ACX) 3 min. 5. First Affirmative Rebuttal (1 AR) 4 min. 6. Negative Rebuttal (NR) 6 min. 7. Second Affirmative Rebuttal (2 AR) 3 min. Preparation: Each debater has a maximum of three minutes preparation time to be used during the course of the debate. 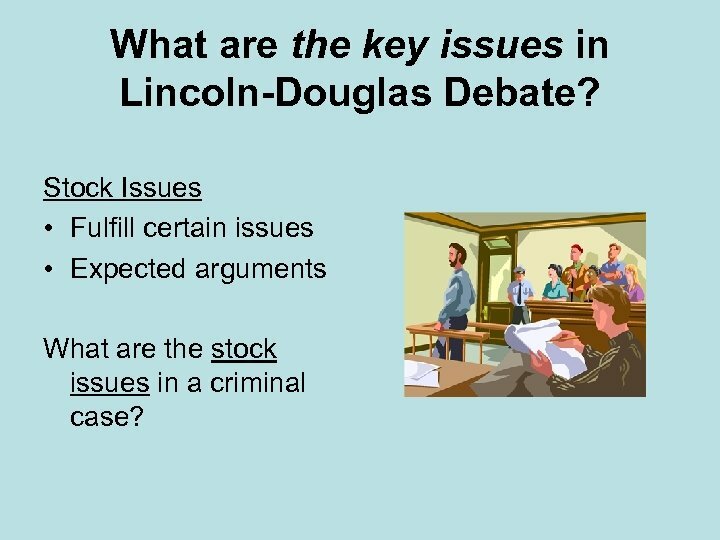 What are the key issues in Lincoln-Douglas Debate? 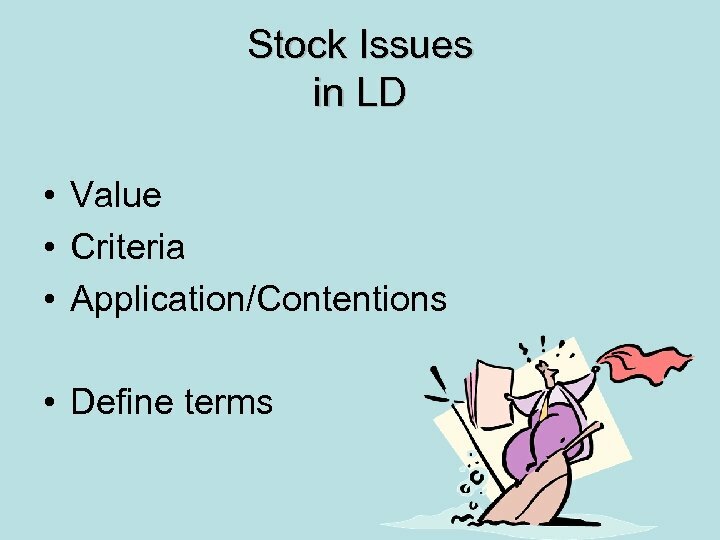 Stock Issues • Fulfill certain issues • Expected arguments What are the stock issues in a criminal case? 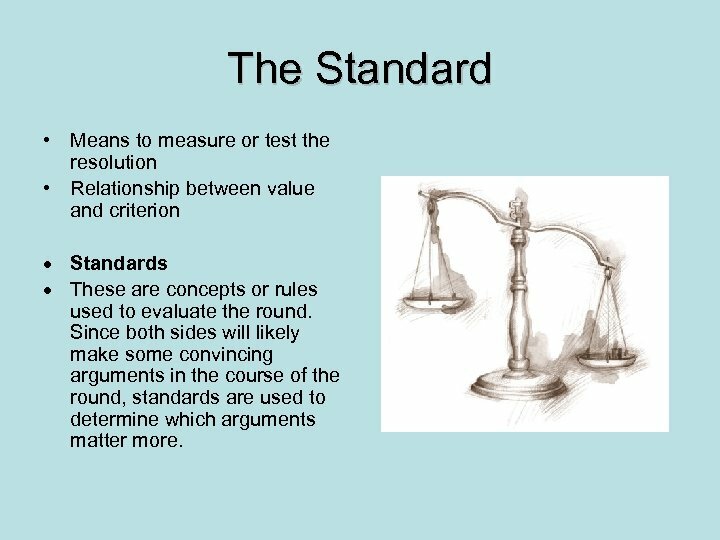 The Standard • Means to measure or test the resolution • Relationship between value and criterion Standards These are concepts or rules used to evaluate the round. 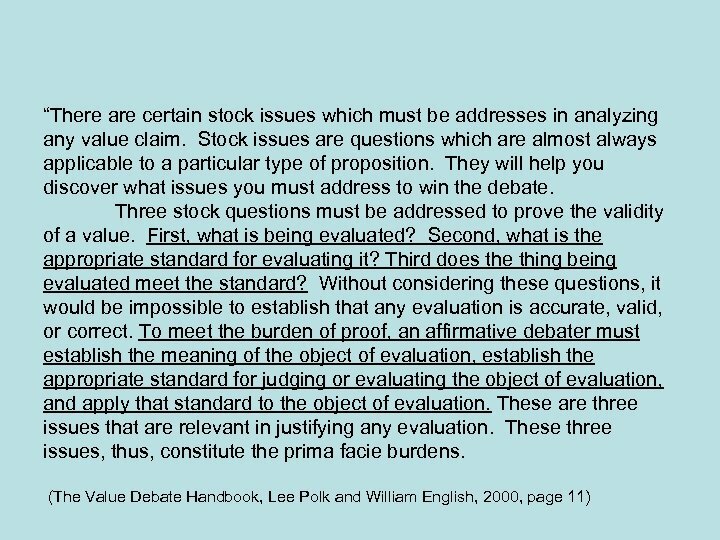 Since both sides will likely make some convincing arguments in the course of the round, standards are used to determine which arguments matter more. 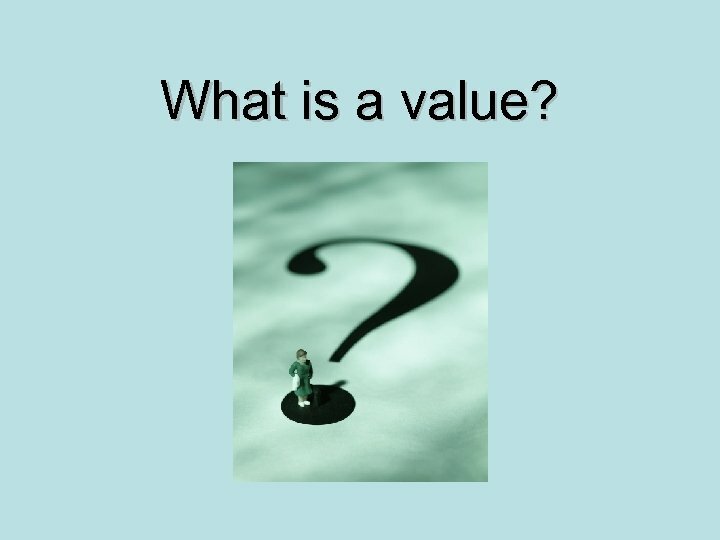 The Value The "value", "core value", or "value premise" represents the most important goal for the round are usually nebulous and somewhat vague good objects. Out of fairness and convention debaters rarely use values which bias one side over the other. The wording of certain resolutions may implicitly prescribe the best value for the round. For example, the resolution "Democracy is best served by strict separation of church and state" implicitly suggests a value of "democracy". Since the wording of the resolution guides the selection of values the two debaters may have identical or similar values. In these circumstances focus is usually shifted to the criterion. 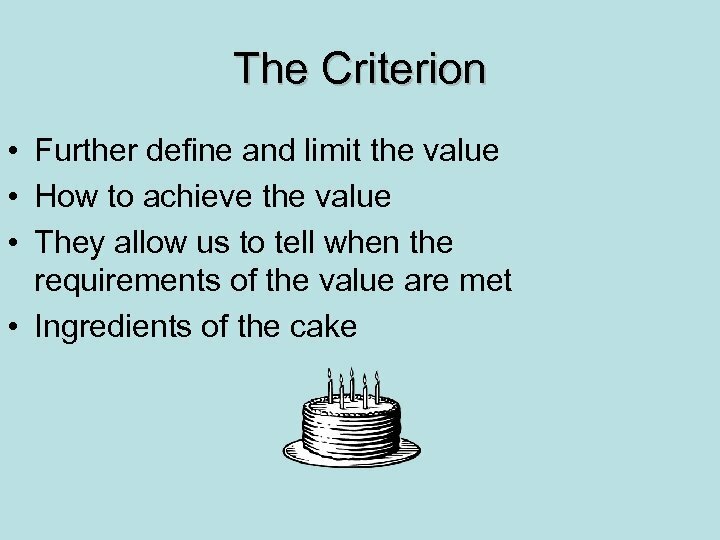 The "criterion" or "value criterion" is the conceptual mechanism the debater proposes to achieve and weigh the value. 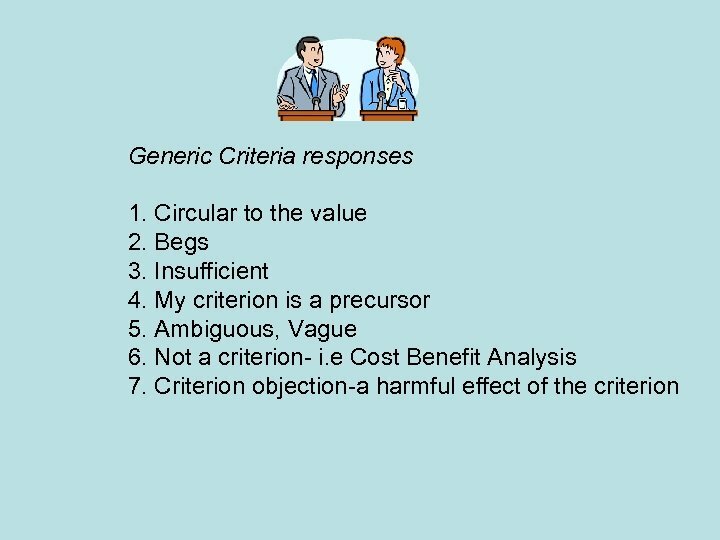 Oftentimes, the debater will simply talk about the criterion, so it is sometimes referred to as the standard, in and of itself. 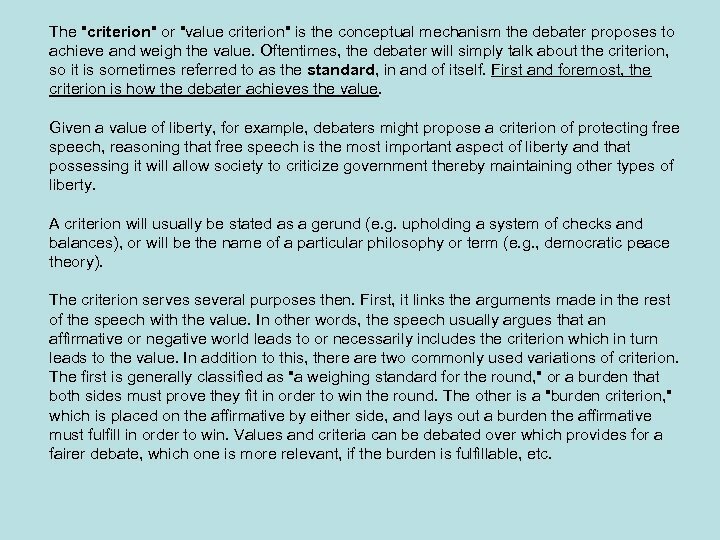 First and foremost, the criterion is how the debater achieves the value. Given a value of liberty, for example, debaters might propose a criterion of protecting free speech, reasoning that free speech is the most important aspect of liberty and that possessing it will allow society to criticize government thereby maintaining other types of liberty. 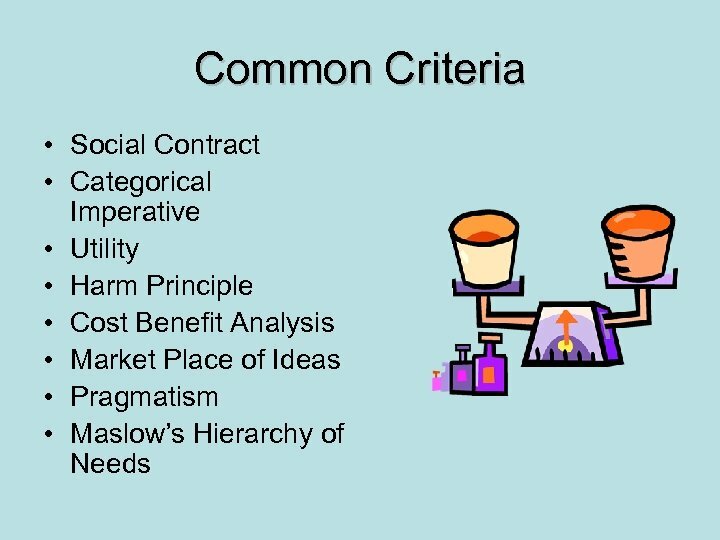 A criterion will usually be stated as a gerund (e. g. upholding a system of checks and balances), or will be the name of a particular philosophy or term (e. g. , democratic peace theory). The criterion serves several purposes then. First, it links the arguments made in the rest of the speech with the value. In other words, the speech usually argues that an affirmative or negative world leads to or necessarily includes the criterion which in turn leads to the value. 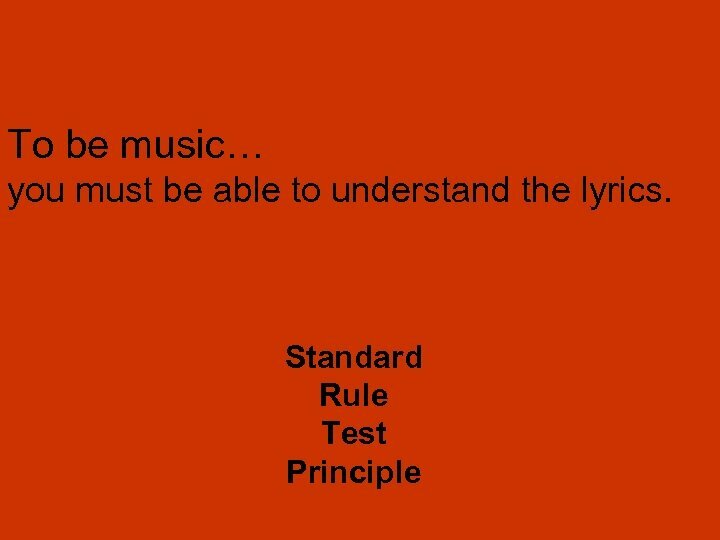 In addition to this, there are two commonly used variations of criterion. The first is generally classified as "a weighing standard for the round, " or a burden that both sides must prove they fit in order to win the round. 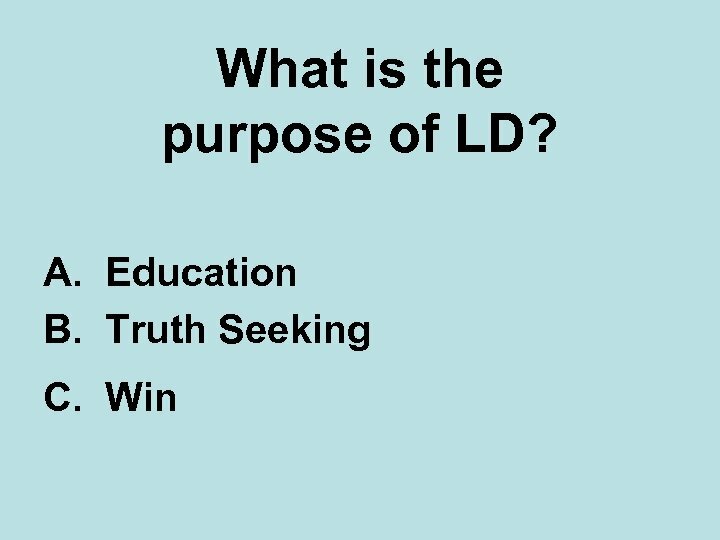 The other is a "burden criterion, " which is placed on the affirmative by either side, and lays out a burden the affirmative must fulfill in order to win. 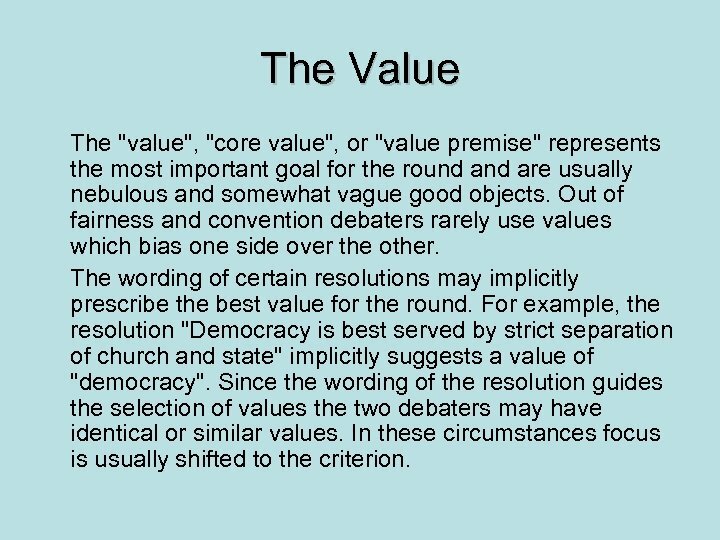 Values and criteria can be debated over which provides for a fairer debate, which one is more relevant, if the burden is fulfillable, etc. 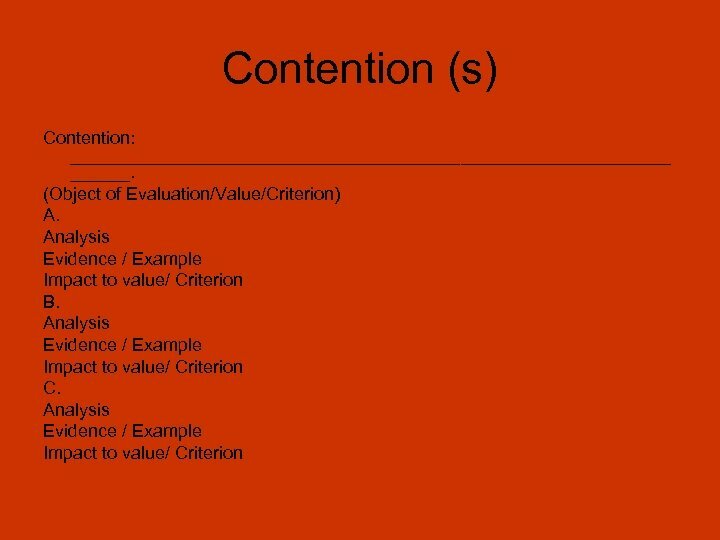 How to choose and establish an appropriate criterion: A. Establish how your criterion achieves your value. You must prove how your criterion achieves your value, or else you are not affirming or negating. 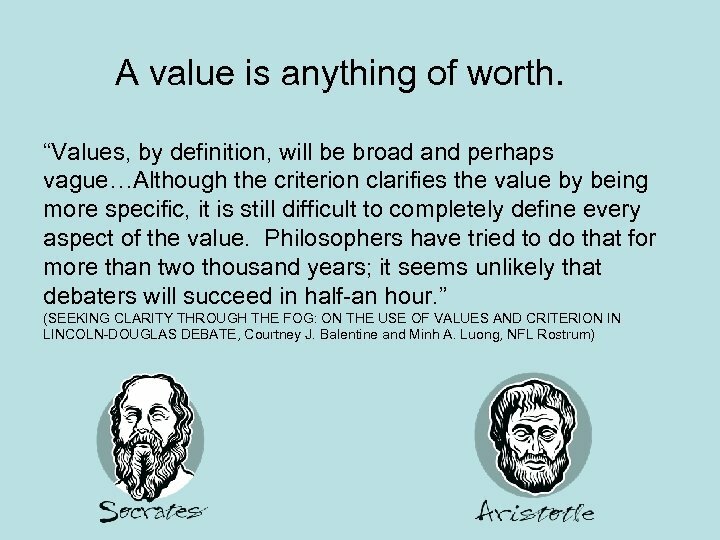 This is true because if you are saying you value something, you must prove how you achieve this value in the context of the round. 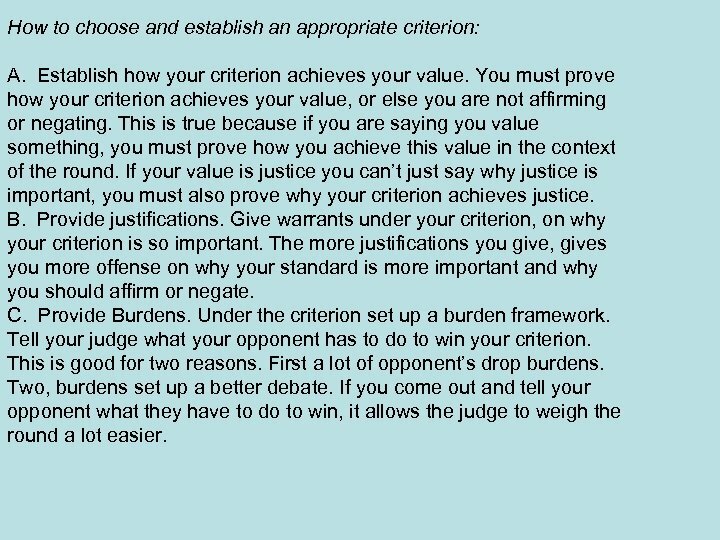 If your value is justice you can’t just say why justice is important, you must also prove why your criterion achieves justice. B. Provide justifications. 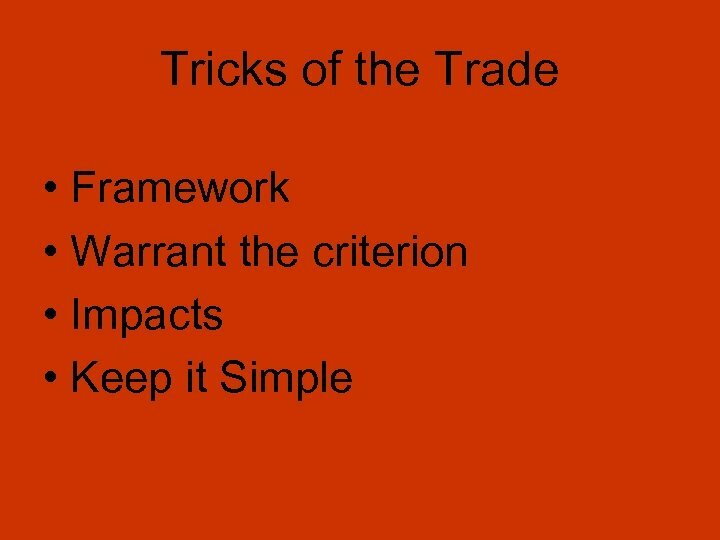 Give warrants under your criterion, on why your criterion is so important. The more justifications you give, gives you more offense on why your standard is more important and why you should affirm or negate. C. Provide Burdens. 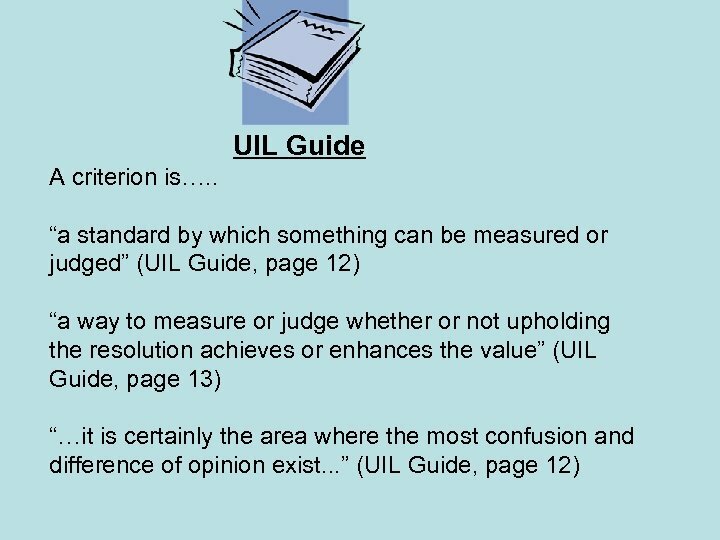 Under the criterion set up a burden framework. Tell your judge what your opponent has to do to win your criterion. This is good for two reasons. First a lot of opponent’s drop burdens. Two, burdens set up a better debate. If you come out and tell your opponent what they have to do to win, it allows the judge to weigh the round a lot easier. The role of the constructive is to lay out your position. 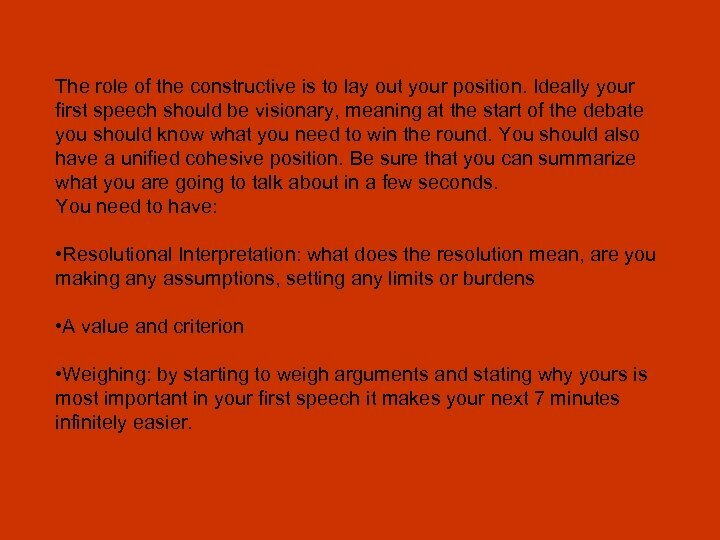 Ideally your first speech should be visionary, meaning at the start of the debate you should know what you need to win the round. You should also have a unified cohesive position. Be sure that you can summarize what you are going to talk about in a few seconds. 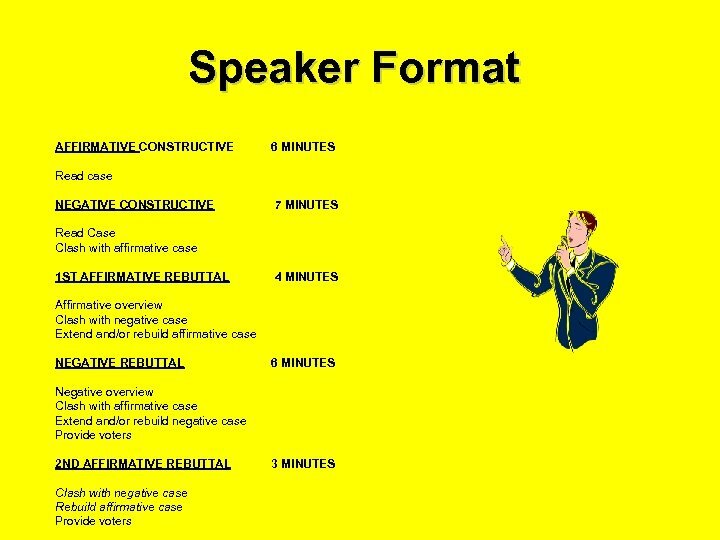 You need to have: • Resolutional Interpretation: what does the resolution mean, are you making any assumptions, setting any limits or burdens • A value and criterion • Weighing: by starting to weigh arguments and stating why yours is most important in your first speech it makes your next 7 minutes infinitely easier. 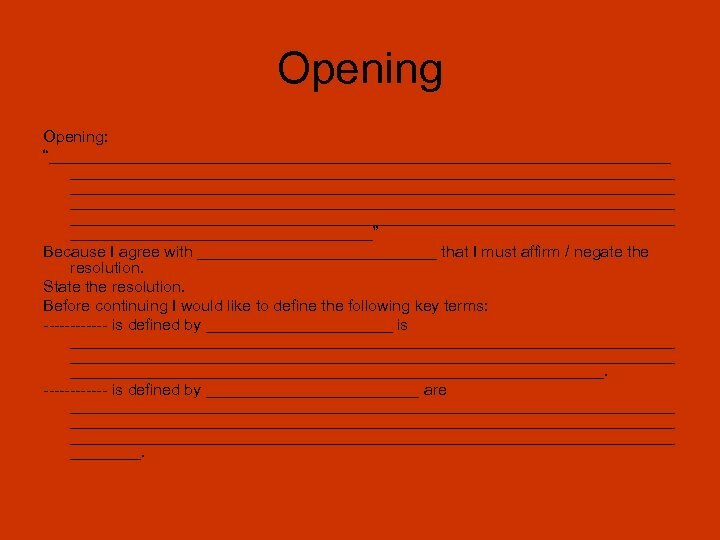 Opening: “_______________________________________________________________________________________________________” Because I agree with ______________ that I must affirm / negate the resolution. State the resolution. Before continuing I would like to define the following key terms: ------ is defined by ___________ is ____________________________________________________________________. ------ is defined by ____________ are ____________________________________________________________________ ____. 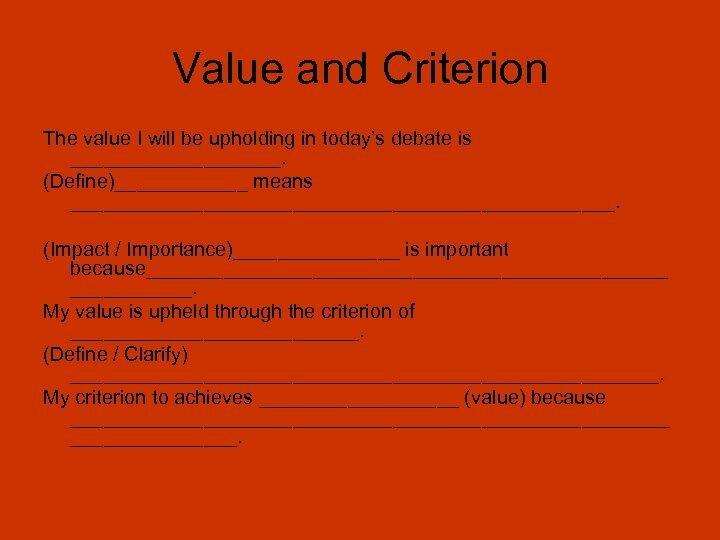 Value and Criterion The value I will be upholding in today’s debate is __________. 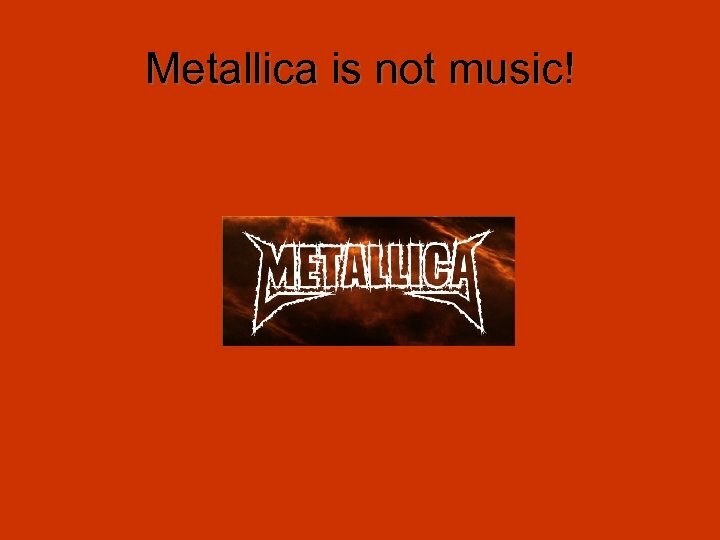 (Define)______ means _________________________. (Impact / Importance)________ is important because________________________. My value is upheld through the criterion of _____________. (Define / Clarify) ___________________________. My criterion to achieves _________ (value) because ___________________________. Framework Please allow me to make an observation: Affirmative Burden The affirmative must prove that freedom of expression ought to be valued above political correctness. Weighing one implication with another is the only way we can actually determine which value should be prioritized. Therefore my opponent can’t just say vote affirmative, because political correctness violates freedom of expression. My opponent has to show why the implications of violating freedom of expression outweigh the implications I give at the point you don’t have political correctness. This must be the way we determine who wins the round, because rights conflicts will always arise, and the only way we can determine how to solve that conflict is by determining which side of the conflict has more severe implications. 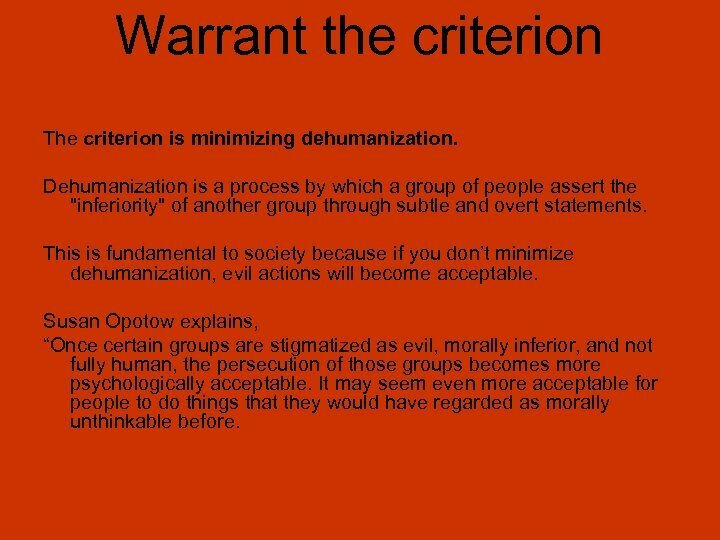 Warrant the criterion The criterion is minimizing dehumanization. Dehumanization is a process by which a group of people assert the "inferiority" of another group through subtle and overt statements. This is fundamental to society because if you don’t minimize dehumanization, evil actions will become acceptable. Susan Opotow explains, “Once certain groups are stigmatized as evil, morally inferior, and not fully human, the persecution of those groups becomes more psychologically acceptable. It may seem even more acceptable for people to do things that they would have regarded as morally unthinkable before. 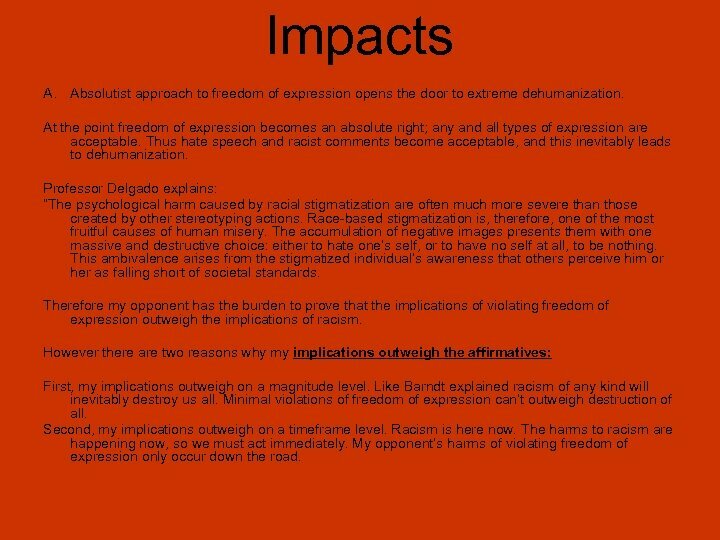 Impacts A. Absolutist approach to freedom of expression opens the door to extreme dehumanization. At the point freedom of expression becomes an absolute right; any and all types of expression are acceptable. Thus hate speech and racist comments become acceptable, and this inevitably leads to dehumanization. Professor Delgado explains: “The psychological harm caused by racial stigmatization are often much more severe than those created by other stereotyping actions. Race-based stigmatization is, therefore, one of the most fruitful causes of human misery. The accumulation of negative images presents them with one massive and destructive choice: either to hate one’s self, or to have no self at all, to be nothing. This ambivalence arises from the stigmatized individual’s awareness that others perceive him or her as falling short of societal standards. Therefore my opponent has the burden to prove that the implications of violating freedom of expression outweigh the implications of racism. 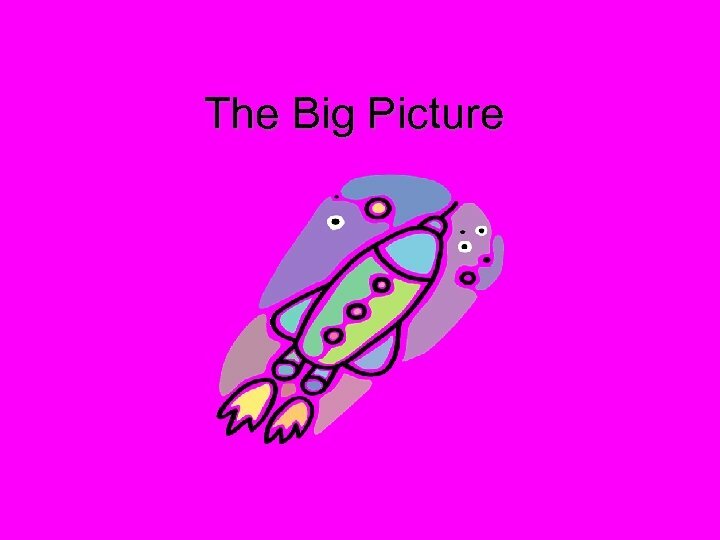 However there are two reasons why my implications outweigh the affirmatives: First, my implications outweigh on a magnitude level. Like Barndt explained racism of any kind will inevitably destroy us all. Minimal violations of freedom of expression can’t outweigh destruction of all. Second, my implications outweigh on a timeframe level. Racism is here now. The harms to racism are happening now, so we must act immediately. My opponent’s harms of violating freedom of expression only occur down the road. 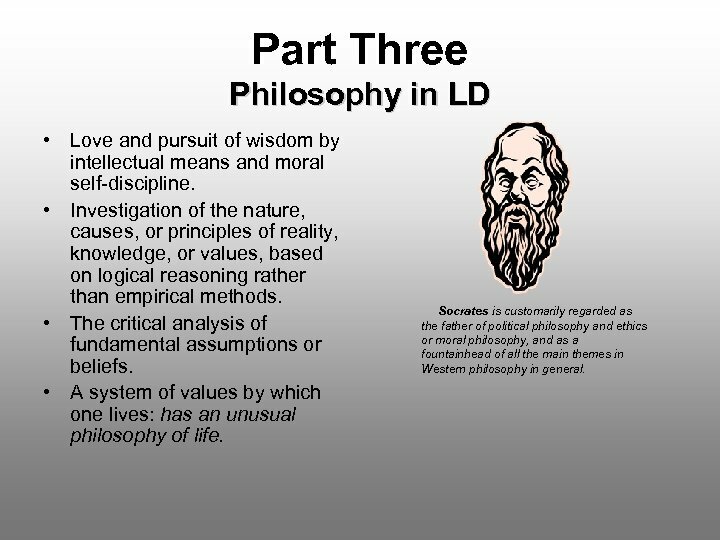 Part Three Philosophy in LD • Love and pursuit of wisdom by intellectual means and moral self-discipline. • Investigation of the nature, causes, or principles of reality, knowledge, or values, based on logical reasoning rather than empirical methods. 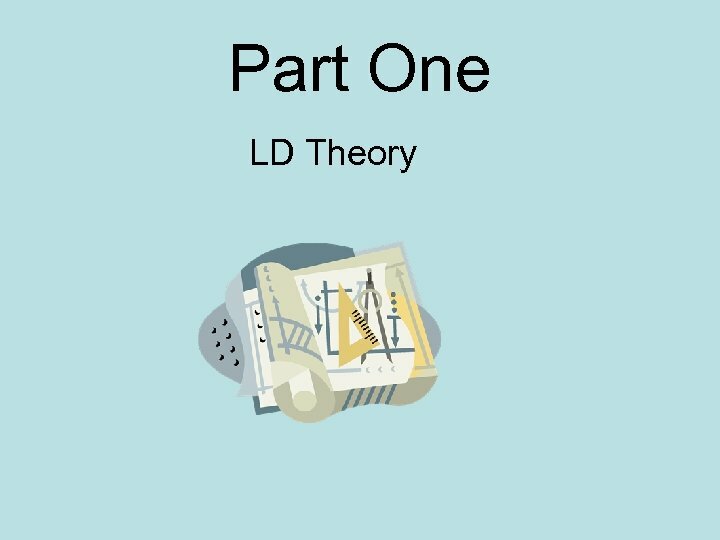 • The critical analysis of fundamental assumptions or beliefs. • A system of values by which one lives: has an unusual philosophy of life. Socrates is customarily regarded as the father of political philosophy and ethics or moral philosophy, and as a fountainhead of all the main themes in Western philosophy in general. I. Kant -Categorical Imperative Act only on that maxim through which you can at the same time will that it should become a universal law -Duty ethics i. Only absolutely good is a good will ii. 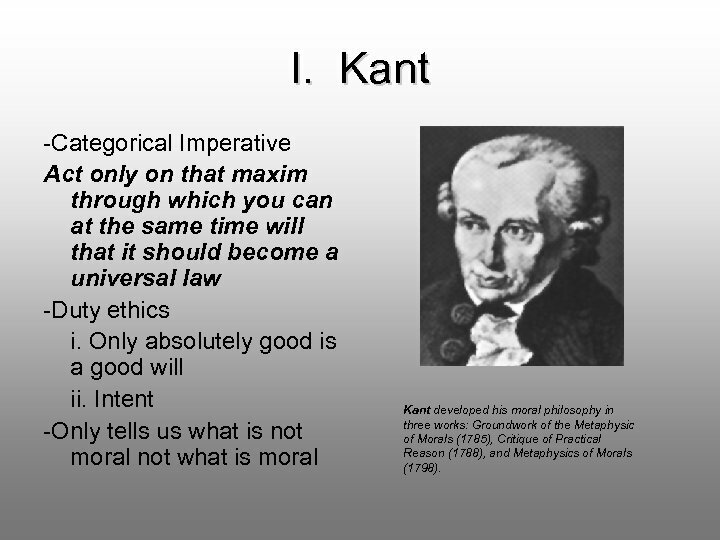 Intent -Only tells us what is not moral not what is moral Kant developed his moral philosophy in three works: Groundwork of the Metaphysic of Morals (1785), Critique of Practical Reason (1788), and Metaphysics of Morals (1798). II. 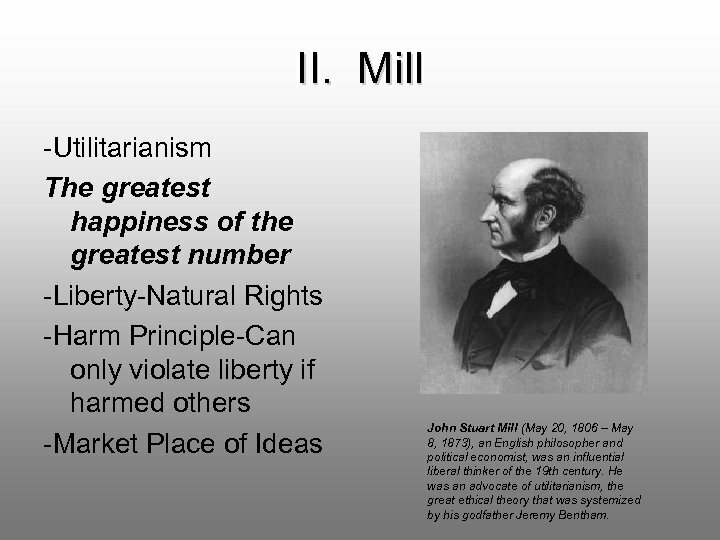 Mill -Utilitarianism The greatest happiness of the greatest number -Liberty-Natural Rights -Harm Principle-Can only violate liberty if harmed others -Market Place of Ideas John Stuart Mill (May 20, 1806 – May 8, 1873), an English philosopher and political economist, was an influential liberal thinker of the 19 th century. He was an advocate of utilitarianism, the great ethical theory that was systemized by his godfather Jeremy Bentham. III. 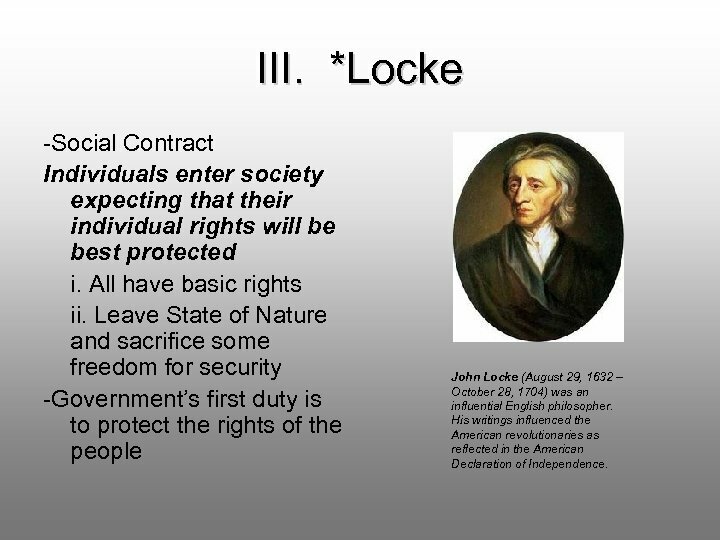 *Locke -Social Contract Individuals enter society expecting that their individual rights will be best protected i. All have basic rights ii. Leave State of Nature and sacrifice some freedom for security -Government’s first duty is to protect the rights of the people John Locke (August 29, 1632 – October 28, 1704) was an influential English philosopher. His writings influenced the American revolutionaries as reflected in the American Declaration of Independence. IV. 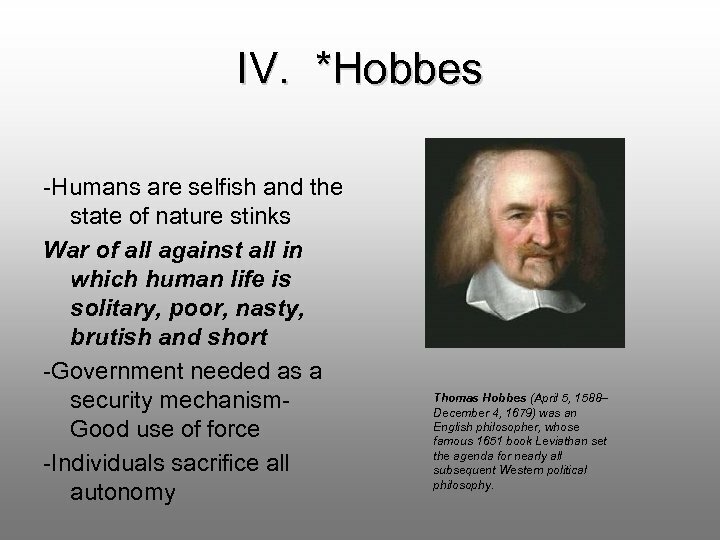 *Hobbes -Humans are selfish and the state of nature stinks War of all against all in which human life is solitary, poor, nasty, brutish and short -Government needed as a security mechanism. Good use of force -Individuals sacrifice all autonomy Thomas Hobbes (April 5, 1588– December 4, 1679) was an English philosopher, whose famous 1651 book Leviathan set the agenda for nearly all subsequent Western political philosophy. 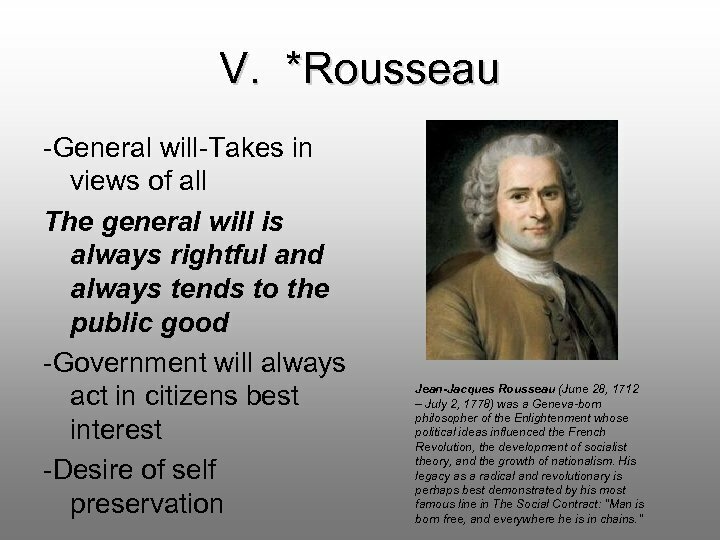 V. *Rousseau -General will-Takes in views of all The general will is always rightful and always tends to the public good -Government will always act in citizens best interest -Desire of self preservation Jean-Jacques Rousseau (June 28, 1712 – July 2, 1778) was a Geneva-born philosopher of the Enlightenment whose political ideas influenced the French Revolution, the development of socialist theory, and the growth of nationalism. His legacy as a radical and revolutionary is perhaps best demonstrated by his most famous line in The Social Contract: "Man is born free, and everywhere he is in chains. " VI. 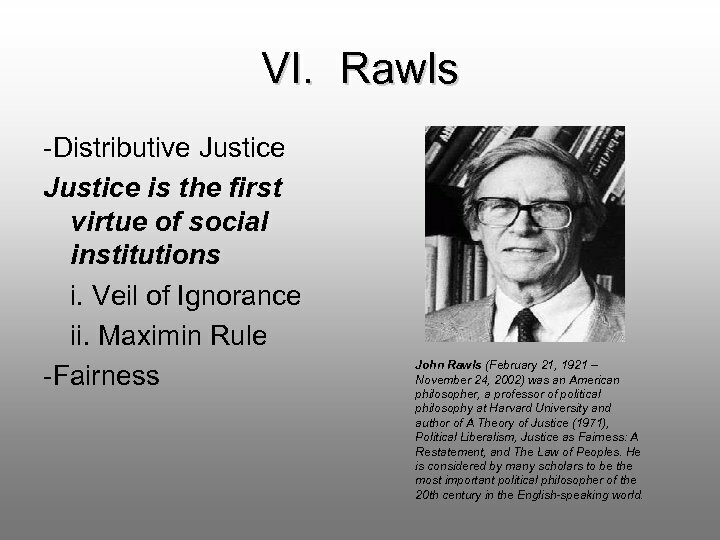 Rawls -Distributive Justice is the first virtue of social institutions i. Veil of Ignorance ii. 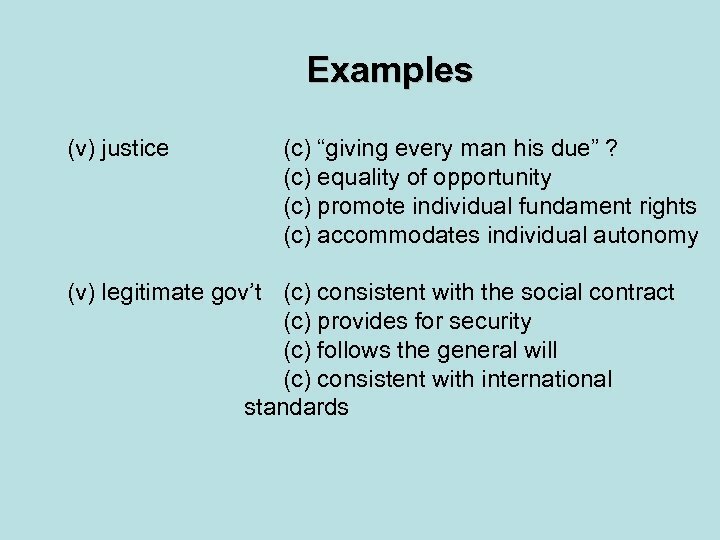 Maximin Rule -Fairness John Rawls (February 21, 1921 – November 24, 2002) was an American philosopher, a professor of political philosophy at Harvard University and author of A Theory of Justice (1971), Political Liberalism, Justice as Fairness: A Restatement, and The Law of Peoples. He is considered by many scholars to be the most important political philosopher of the 20 th century in the English-speaking world. VII. 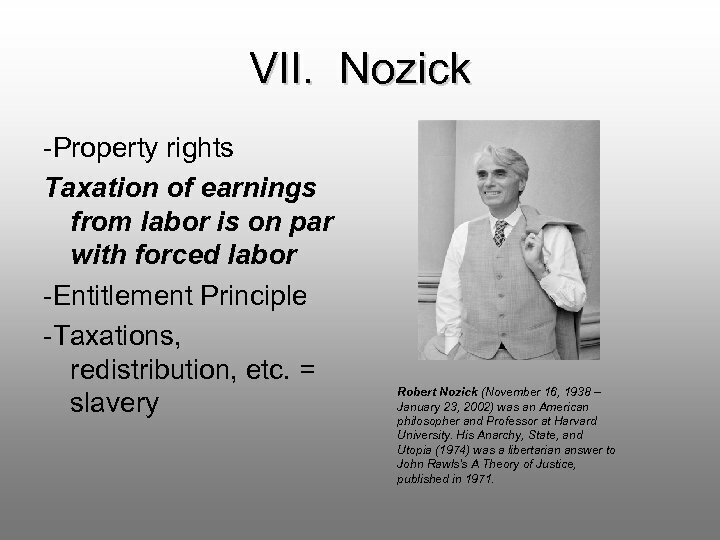 Nozick -Property rights Taxation of earnings from labor is on par with forced labor -Entitlement Principle -Taxations, redistribution, etc. = slavery Robert Nozick (November 16, 1938 – January 23, 2002) was an American philosopher and Professor at Harvard University. His Anarchy, State, and Utopia (1974) was a libertarian answer to John Rawls's A Theory of Justice, published in 1971.